And, behold, there was a man named Zacchaeus, who was the chief among the tax collectors, and he was rich. And he sought to see who Jesus was; and could not for the crowd, because he was little of stature. 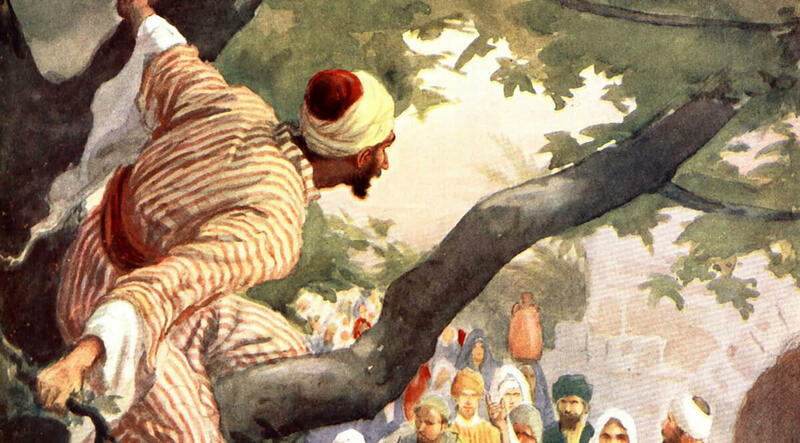 And he ran on ahead, and climbed up into a sycamore tree to see him: for he was to pass that way. And when Jesus came to the place, he looked up, and saw him, and said unto him, Zacchaeus, make haste, and come down; for today I must abide at your house. And he made haste, and came down, and received him joyfully. And when they saw it, they all murmured, saying, That he was gone to be guest with a man that is a sinner. And Zacchaeus stood, and said unto the Lord; Behold, Lord, the half of my goods I give to the poor; and if I have taken anything from any man by false accusation, I restore him fourfold. And Jesus said unto him, This day is salvation come to this house, since he also is a son of Abraham. For the Son of man came to seek and to save that which was lost.